I've never ridden the Seven Dwarfs Mine Train in Walt Disney World, but I have been on its cousin over in Shanghai Disneyland. Like the Florida original, the Shanghai Disneyland attraction is part dark ride, part roller coaster, using specially designed "swinging" mine cars to add extra lateral dimension to the experience. The dark ride portion, thankfully, is much more tame. 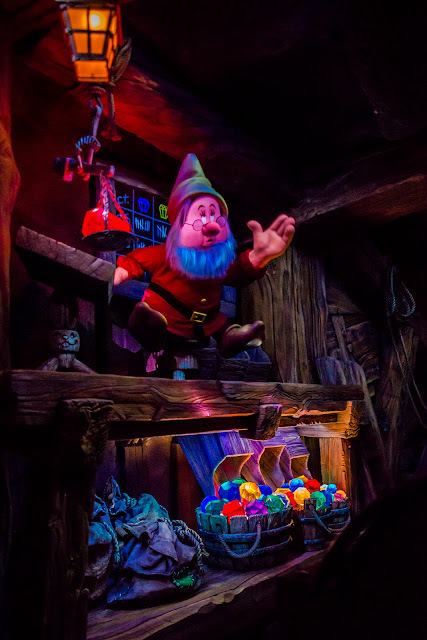 It's effectively a trip through the glimmering, colorful mines where Snow White's Seven Dwarfs mine for treasures of untold wonder and imagination. They're pretty skilled miners too, because they're always unearthing jewels galore, so much so that when it comes time to count them, there are bucketfuls to transport. Why no one else has ever caught onto this motherlode is a mystery. They must have really good security. But at least they're nice enough to let riders take a tour through their treasure cavern, before a thrilling, high speed second half!